he FAT Fannya��s Cafe is your peek into a forgotten world of black and white television sets, antique telephones and hurricane lamps. Sewing machine bottoms serve as tables while toggle switches provide lighting for the small, charming space. But what the cafe lacks in square-footage, it makes up for in portion size, as we soon found out. Run by the erstwhile shipbuilding families of Fort Kochi, the cuisine is a mix of colonial Indian and European classics a�� a result of the heavy Portuguese and Dutch influence on the region. The dishes are simple and homely, taken from the recipe book of their favourite granny or a�?fannya��. a�?This is a way for us to remember and honour our Fanny,a�? explains Ajay James, one of the brothers who own the family-run breakfast joint, adding, a�?The cafe is more or less an extension of our family home in Fort Cochin, we have infused some of it into the design and the food, going all the way to our ancestors, the Portuguese and Dutch, and British.a�? Choosing the biggest table to accommodate our party of five, we ordered the Admirality Meal, appam with vegetable stew, and waffles. The Admirality option is a hearty affair, definitely not for the weak hearted. The platter includes a choice of eggs, sausage, bacon, creamed mushroom and spinach, toast, baked beans, hash browns, cereal, pancakes, fresh juice, a muffin and tea or coffee. Though shared by two people, there was enough left over to feed a third person. We loved the creamed mushroom and spinach, with its rich earthy flavours while their homemade papaya marmalade had us devouring the toast. The coffee too is served in a generously-sized mug, which we struggled to finish, though it was up to the mark. 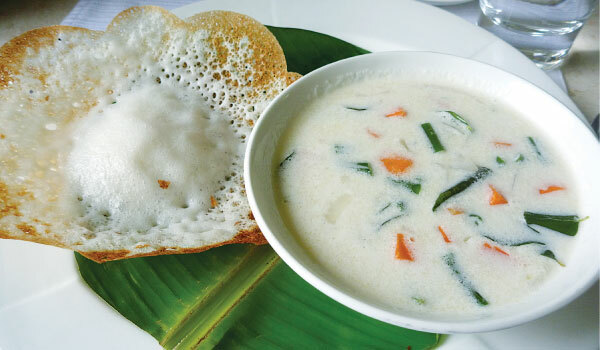 Appams come with an accompaniment of your choice, like pork vindaloo, chicken curry, mutton kheema, fish moilee, and prawn or beef curry, but we chose the vegetarian option, for a well-balanced meal. The appams were light and fluffy, crisp on the edges and pillowy in the middle, just the way it should be. The vegetable stew was simply delicious too with broccoli, carrots, and peas sitting in a large bowl of pale white coconut-based broth. A word of caution though, the dish includes six appams as we found only after we had finished three that had been brought initially. 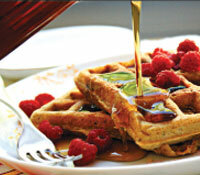 The waffles too are a great option for those whoa��d like to start their day on a sweet note. Beautifully browned in some places, golden in others, they are served with a sprinkling of castor sugar, homemade fruit garnish, honey and maple syrup. 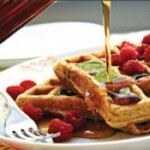 They also serve a decent variety of eggs apart from smoothies, hot and cold chocolate, porridge, wheat conge and muesli. Rs.350 for two. Open from 7am. At 80 ft road, Koramangala.